Posted on September 10, 2013 by Clare Cooks! 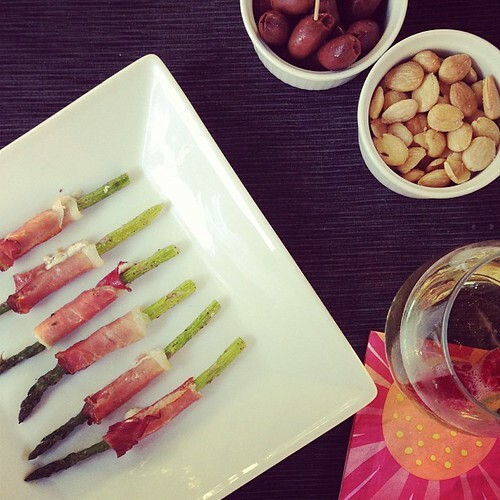 My girlfriend Kelly made this absolutely amazing asparagus appetizers (I love alliteration!) for our last book club meeting. They were delicious! And so simple. I made them at home for a little Monday evening aperitivo. These are definitely a great bite for a last-minute wine and cheese party and definitely worthy of sharing with guest. Next time I have a dinner party, these will be on the menu. I’m actually kind of looking for any excuse to make these again. You can use any soft, spreadable cheese. I would avoid cream cheese, but any other soft cheese should work. I think Boursin would be amazing. 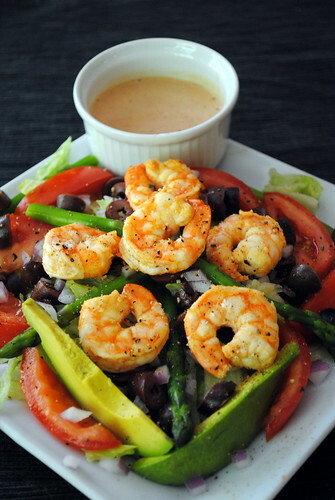 Making this appetizer into a side dish would be very easy to do. I would leave the prosciutto slice whole and wrap it around 3-5 pieces of asparagus and cook them the same way (maybe a minute or two longer). I think it would make for a really tasty side dish, but I really like how the individual spears of asparagus and prosciutto get super crispy. Pre-heat the oven to 400F degrees. Spread the goat cheese on each slice of prosciutto. 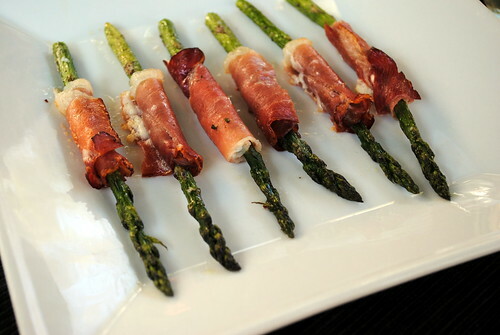 Wrap each asparagus spear in a 1/3 slice of prosciutto and goat cheese. Bake for 6-8 minutes, until warm and starting to crisp. Serve and become the hit of the party! Posted on August 28, 2013 by Clare Cooks! The Crab Louie has been a San Francisco classic since the early 1900s. Since there has been no crab around this kitchen since the infamous crab cake incident of 2011, I substituted the only shellfish that has yet to make an attempt on my life, shrimp! I’ve never actually had a shrimp/crab Louie before, so I don’t have basis for comparison, but this salad was delicious. It made an extremely enjoyable and beautiful lunch. It might seem like there are a lot of ingredients, but it came together very easily. I definitely plan on make it again. I think it would be perfect for a fancy luncheon or if you have guests. 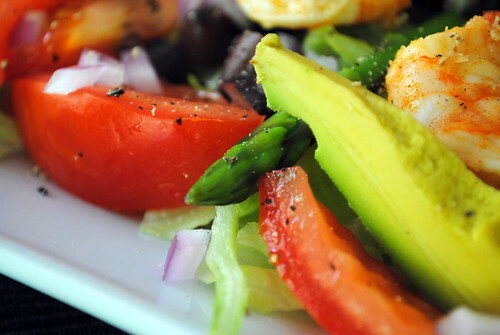 A traditional Louie salad involves hard-boiled eggs, but since cannot stand the sight or texture of egg yolks, I left them out. They definitely were not missed. I also used kalamata olives instead of regular black olives, mainly because they were what I had on hand, but they also provide way more flavor. Every other ingredient was fresh and crisp. Living in Southern California, we get amazing produce year round. Tomatoes and avocados are at their prime and we are still lucky enough to find great asparagus at farmers’ market. The dressing is similar to 1000 Island dressing, but not quite. I read at least 20 different Louie dressing recipes and in the end just picked the ingredients that sounded best to me. I like my dressings on the tangy side and most of them sounded like they would be pretty sweet. I used chili sauce, which I think is super sweet to begin with, so I did not add any extra sugar. I also used dill pickle relish and more lemon juice than most called for. This helped to cut the sweetness (it still had some, but not too much) and thinned out the dressing. Gloopy dressing is never a good thing. I also added Worcestershire sauce, Tabasco and paprika for color and flavor. In a bowl, whisk together all ingredients. Add salt and pepper to taste. Place in fridge while cooking shrimp and assembling salad. Heat oven to 400F. Combine shrimp and all other ingredients in a small bowl or plastic bag. Toss to coat. 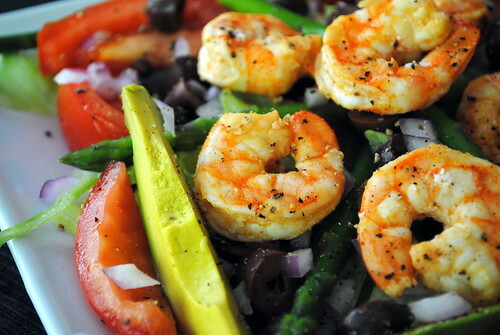 Place the shrimp on a rimmed baking sheet. Roast in the oven for 6-7 minutes, or until shrimp are nice and pink. Let cool slightly while you assemble the salad. Divide lettuce between two plates. Divide the rest of the ingredients between the plates of lettuce. Serve with dressing on the side and enjoy! Posted on March 15, 2013 by Clare Cooks! I was quite happy to find asparagus everywhere at farmers’ market last weekend. 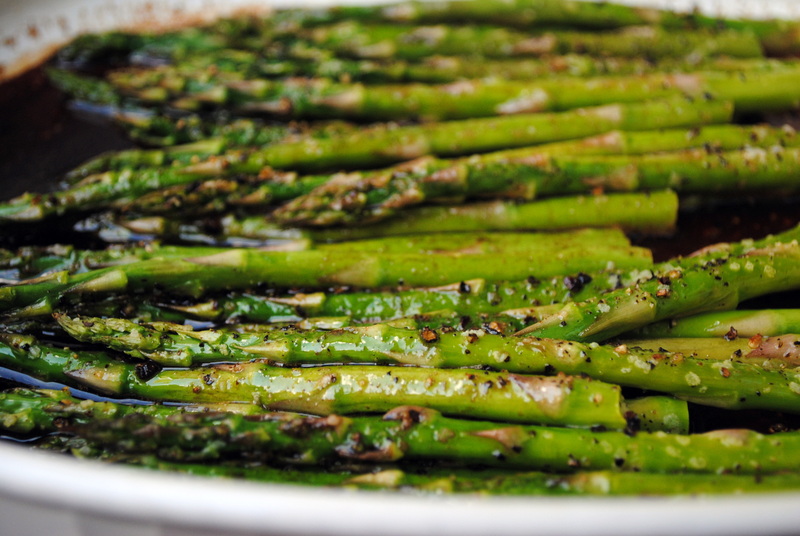 I love asparagus, especially during the spring when it’s super thin and not gross and woody. Roasting just about any vegetable makes it about 100 times better in my book and asparagus is no exception. Roasting the asparagus give it a little crispy crust to the tips that is just amazing. While not a traditional Irish side dish, it’s green, seasonal and delicious. It’s also one of the simplest side dishes in the world. Perfect for a quick, weeknight dinner or a fancy dinner party. 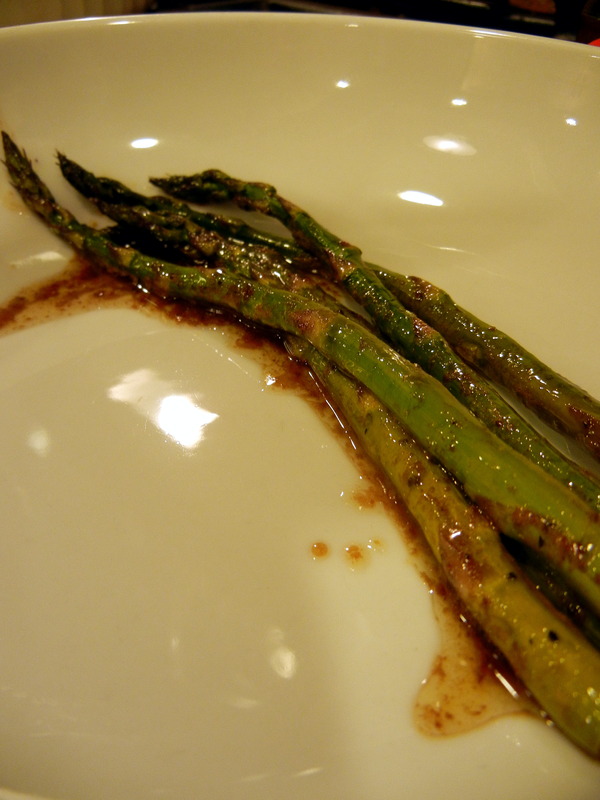 This dish is adapted from my balsamic roasted asparagus, but I made an amazing garlic brown butter sauce instead of the balsamic. As much as I love balsamic, it is a bit harsh and very overpowering. I think the garlic brown butter sauce works with a lot more dishes. Excuse the Instagram photo, I wasn’t planning on posting this originally, but it turned out too delicious not to. Arrange the asparagus on a rimmed baking sheet. Spray lightly with cooking spray until coated and season with salt and pepper. 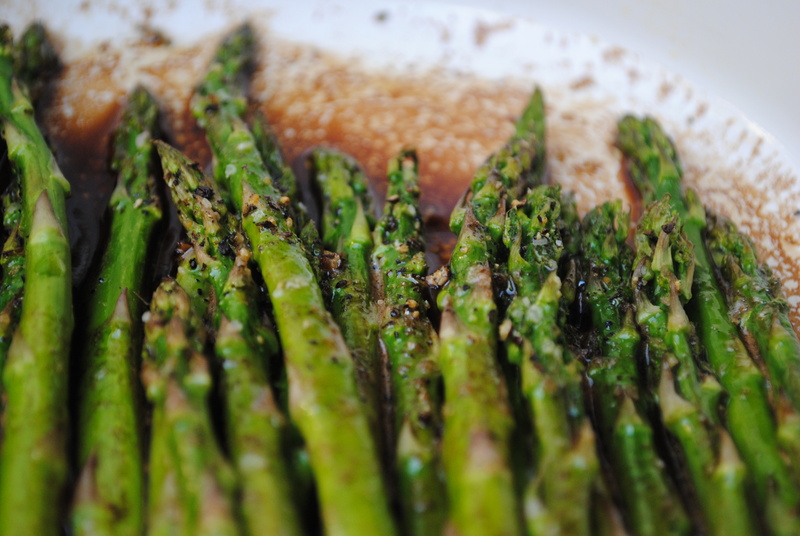 Place the asparagus in the oven and roast for 12 to 15 minutes, or until tender and just starting to crisp. While the asparagus is in the oven, melt the butter in a saucepan over medium heat. Once the butter is almost completely melted, add in the minced garlic. Stir to coat. Allow the garlic to cook until crispy, stirring occasionally so the butter and garlic don’t burn. When the asparagus is done, place in serving dish and pour garlic and butter over. Serve immediately. Posted on November 16, 2011 by Clare Cooks! 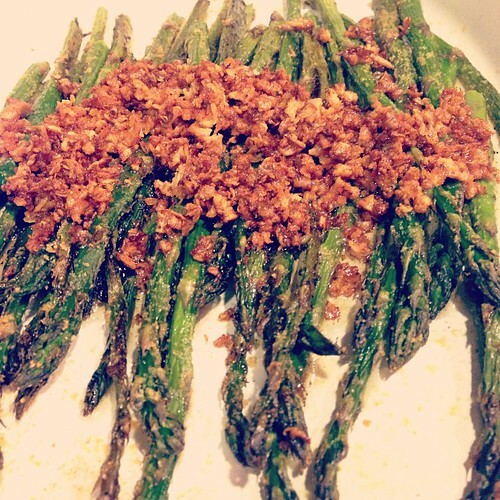 I love asparagus and this is by far one of my favorite asparagus recipes. It combines two of my favorite things, asparagus and balsamic, so I knew right off the bat that it was going to be a keeper. It could not be simpler to make and it will be ready in less than 15 minutes. What’s not to love? Arrange the asparagus on a baking sheet. Coat with cooking spray, and season with salt and pepper. Bake asparagus 12 minutes in the preheated oven, or until tender. Melt the butter in a saucepan over medium heat. Remove from heat, and stir in soy sauce and balsamic vinegar. Pour over the baked asparagus to serve. Posted on March 6, 2011 by Clare Cooks! In a desperate attempt to use up my tofu from Costco (so much tofu…) before it went off, I’ve been trying to get creative with it. I must confess that I actually don’t really care for tofu too much, but I’m also trying to move away from overly processed sources of protein (ie, most frozen veggie burgers), so I’m trying to learn to like it. I made crispy tofu the other day, which made for a delicious appetizer, but it’s not something you can eat every day. Enter tofu parmesan-ish! 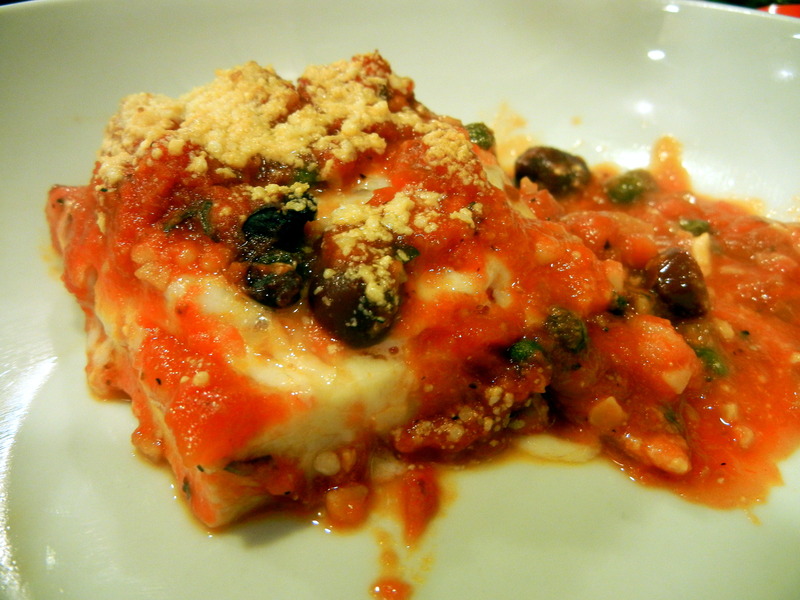 Part overhaul of one of my favorite childhood meals, part not going to the grocery store and having to be creative with the pantry, and all in all a good meal, tofu parmesan-ish was born. I didn’t actually set about making this dish the way it turned out. I was trying to make a tofu dish I used to get at the cafeteria at my old internship (tofu, tomato, onion, cheese, baked together), but when I was putting it together I thought it was looking a bit white. I looked in the cupboard to see if I could find anything to liven things up a bit. Luckily, I had my favorite pasta sauce (Trader Joe’s Roasted Garlic. Yum.) and some olives and capers on hand. I added them to my tofu and stuck them in the oven. Certainly not groundbreaking on the recipe, but very delicious nevertheless. And it’s easily scaleable for a crowed (or using up mass quantities of tofu). Pre-heat oven to 350. Prepare tofu. Slice onion and tomato. 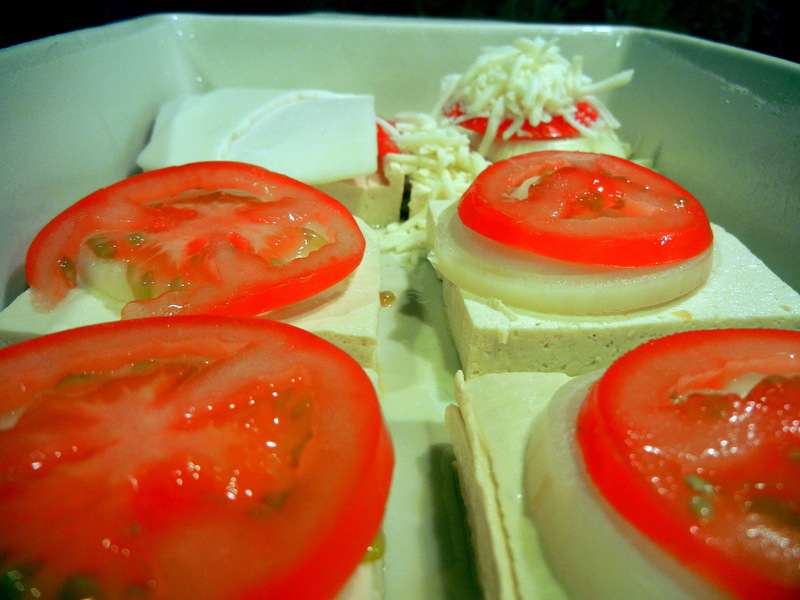 In a baking dish, layer the tofu with onion and tomato on top. Add Cheese if wanted. Add tomato sauce, kalamatas and capers. Top with cheese. Bake for 25-35 minutes or until the cheese is melted and lightly browned. Serve and enjoy!